Peter Robinson is the best selling writer of the Inspector Banks novels, which have been made into an ITV series starring Stephen Tomkinson premiering in September 2010. Peter has been praised for his intricate and realistic plots as well as the empathy in his characters that jumps off the pages. 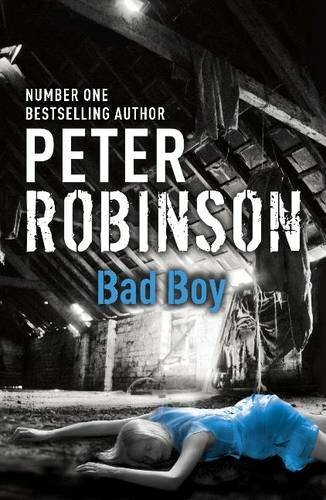 Bad Boy is the nineteenth book in the series and welcomes Alan Banks back to work after a necessary period of rest. Hi, Peter. To start, for those who do not know you yet, please tell us about yourself. That’s a very broad question! Let’s just say that I grew up in Leeds, where I went to school and university, then moved to Windsor, Canada, in the mid seventies to do a master’s degree in English and Creative Writing. I had no intention of staying in Canada, but that was how things worked out. Joyce Carol Oates was teaching there at the time and I studied with her, but I was writing only poetry then. I didn’t get the crime fiction bug until I was well into my PhD in the early eighties, and my first Banks novel, Gallows View, was published in 1987. By then I was living in Toronto and making frequent visits back to Yorkshire. My writing career plodded along for about ten books, barely known outside North America, until In a Dry Season came as a breakthrough of sorts in 1999, selling well in the UK, Germany, Sweden, France and many other countries. A couple of years later Aftermath took everything a step further. I still live in Toronto, but now I also spend a good part of the year living in Richmond, North Yorkshire. Congratulations on having the Alan Banks books picked up for TV. Stephen Tompkinson is playing the lead – how does that work for you? It works fine. When Stephen first heard he was going to play the role, he got in touch with me and visited me in Florida, where I was staying at the time. We spent a few days lunching and dining and visiting the Dali museum, and he wanted to know everything I could tell him about Banks. There’s dedication for you! Anyway, we got on well together and I was impressed with his professionalism. I thought he was a bit too tall for my vision of Banks, but knew he was a good enough actor to play short. He doesn’t need to, though. There’s no way you’ll ever get an actor who fits everyone’s picture of a fictional character, so you might as well not worry about the physical aspect and concentrate on the essence. Stephen’s Banks is perhaps a bit more intense, angry, haunted and guilt-ridden than mine is, but it all works wonderfully. This is television, after all, without the benefit of those inner monologues you get in novels. The drama is heightened, and we follow a man going through a terrible journey from a sense of failure to success of a kind, with a lot of bumps in the road. Stephen depicts that journey with great skill and economy, often suggesting far more than he shows. By the way, the rest of the cast is terrific, too, especially Andrea Lowe as Annie and Lorraine Burroughs as Winsome. Charlotte Riley is scary as Lucy Payne, conveying her creepy and manipulative vulnerability perfectly. I know you went to some of the filming and had a walk-on part (as did your wife). Could you tell us more about that and how it felt? At first I had vowed to have nothing to do with TV. After all, I’d been ignored for long enough and seen enough of my colleagues ill-served by the medium to know that the most sensible course of action was to turn away. On the other hand, I have always been interested in it, so it seemed foolish to look a gift horse in the mouth. Why not take the bull by the horns (I love mixed metaphors) and make hay while the sun shines? I decided to be a visitor. I had no input. I didn’t comment on the script, which I had read and liked, the casting, the locations, the music. I left it all to the pros. But I hung about the set, and, yes, my wife and I were given walk-on parts. You’ll have to be quick to spot us, though! Anyway, it seems they don’t mind writers who don’t interfere hanging about, so I spent quite a bit of time at various locations in Yorkshire chatting with cast, crew, the excellent director James Hawes and producer Francis Hopkinson. I have some great memories. All in all, it was a terrific experience, and the whole process still remains exciting to me, though they work such long hours and have to do everything over and over again. I think we did about ten takes of the walk-on! It would drive me crazy having to work like that every day. It must be difficult to see your work being translated - probably not as you saw it - and adapted for TV; meaning changes to the story to make it work in most cases. How did you feel about that? I think I learned a lot about how the different media work. People often come up to me and tell me my books are so visual that they would need hardly any changes at all to be turned into movies. But that doesn’t allow for the rules and conventions of film and television drama, and the basic differences between a visual and a literary medium. TV always transforms its source material. It has to, to make it work. Certain things need to be signalled much more clearly, or heightened, on television, where you don’t always have the luxury of all those ambiguities and subtleties of character and motive you have in a novel. Words are not the primary medium of film and television – the longer you can get away without anyone having to say anything, the better – but novels are made of words. On the other hand, it may take five or six pages of prose to achieve what can be done with a split-second shot on TV. So the adaptor taketh away and the adaptor giveth. Also, it’s only an adaptation of one book, and you can’t cover every aspect of all the major characters in just one TV drama. It would be nice to see it go to series and watch the ensemble cast develop and the individual characters reveal more of themselves. You’ve said that you are happy that it will make great TV – are you looking forward to fan reactions? I would imagine you’ll also pick up a lot of new readers. Fans sometimes expect far more exact duplication in these adaptations than writers do, so I would expect a mixed reaction. Banks is too tall, Annie is a blonde instead of a brunette, Winsome’s too short, that sort of thing. Minor details. No doubt I’ll get plenty of comments. And some of the changes to the original will annoy a few people, too. It’s also a very violent story, and the producers haven’t shied away from that aspect, so I’ll also no doubt get a few tut-tuts from those fans who are given to tut-tutting! I’m always happy to pick up a few more readers. If nothing else, at least a few more people will have heard of me after this, whether they become fans or not. You were awarded a Doctor of Letters by Leeds University, that must be a wonderful feeling. Tell us about that. I’ve always had a strong connection with the University of Leeds. The head of the English department back in the early seventies, Professor Norman Jeffares, really gave me a chance when I probably didn’t deserve it, going by A level results alone! I’d like to think I deserved his faith in me. A few years ago, I was happy to be in a position to set up a small scholarship for students from less privileged backgrounds who wanted to study English there. I like to think of it as beer, books and CD money. Anyway, they all have far better A level results than I had! While I was at Leeds, I also got to see a lot of incredible concerts in the refectory, including the Who, the Stones, Led Zeppelin, Leonard Cohen, Pink Floyd, Fairport Convention, Captain Beefheart, Hawkwind, Wings, Roy Harper and many others. They cost next to nothing and the place only held about 2000 people. The doctorate was a terrific honour, and the first time I got to parade around in fancy gowns, as I somehow missed all my precious graduations. And it was wonderful to meet Melvyn Bragg, who conferred the degree. I also got an honorary doctorate this summer from the University of Windsor, and I did get a “real” PhD at the University of York, Toronto, so officially I’m “Dr, Dr, Dr” Robinson now! Congratulations on that! Turning now to the book, you have been writing about Alan Banks for quite a while and Bad Boy is the nineteenth. Whilst he (Banks) has aged, it’s not in the same timeline that you’ve been writing. How do you handle ageing him, but not too much to keep him working? The books usually appear a year apart, but the cases may only take place a few months, or even weeks, apart, so Banks doesn’t age a full year between books. Of course, the books do take place at pretty much the time I’m writing them, so some of the music Banks listens to wasn’t actually out by then! It may confuse some people, but it doesn’t confuse me. There’s real time and there’s fictional time. Banks is a fictional character, so he lives in fictional time. He’s had various female friends and is, in my opinion, slightly vulnerable in that way, against the hard shell that he needs to have to be the type of policeman he is. Did you intend for that to happen, or was it part of the character development? None of it was planned. Banks’ vulnerability arises naturally and develops over time. But he’s also resilient and manages to bounce back. I realised I had given him a very hard time over the past few books, so he deserved a holiday at the beginning of Bad Boy! Has Banks ever surprised you? Done something you wouldn’t have seen him doing? Yes. There are scenes in just about every book where he surprises me. It’s part of the fun of writing about him. I think that perhaps when he stops surprising me I’ll know I’ve come to the end. He surprised me in the desert in Bad Boy. You successfully manage to have a supporting cast of characters and keep Annie Cabbot in the thick of things without being overshadowed. Do you find it hard to keep all the individual players in your head? Luckily, there aren’t that many of them. I can just about handle Banks, Annie and Winsome, with Superintendent Gervaise making the occasional appearance. Some characters have fallen by the wayside over the years, too, including Gristhorpe and DS Hatchley, who are still around but in far more minor roles. I’ve also killed off a couple of recurring characters. Usually, if I feel a character isn’t really going anywhere after a few books, he or she either leaves or dies! With regard to Bad Boy – this book starts with Banks on a bit of a personal pilgrimage, holidaying in the US and spending time going places and seeing things he’s always wanted to. After so many cases and the last romantic disappointment, did you feel it was important for him to have some time to think, relax and be away from it all? Yes. And I also needed him out of the way so that what should have been a simple family matter could go horribly wrong. I really thought when I got to the end of All the Colours of Darkness that I had unintentionally written the end of the series, derailed myself. I had stripped Banks of almost everything, so the only alternative, if I wanted to keep him going, was to have him recharge, and that’s what happens while he’s away in America. Of course, he returns to a nightmare almost as bad as the last one, but in some ways he’s better equipped to deal with it. Writing the novella “Like a Virgin” in between the two books really helped, too. In that I had Banks look back on his final case in London in the mid eighties before moving to Yorkshire. I even wrote about his job interview with Gristhorpe. That was fun. It sort of got me back on the Banks track. You have said that Bad Boy came from reading a newspaper and seeing an article about parents turning their children in over drug offences. This is a hand gun – do you think that would happen and is it something you would do? Well, it has happened. If it was in the Guardian, it must be true, right? I don’t think it’s something I could do, no. I think it’s something that parents who have got to the end of their tether might do, but what a terrible dilemma to find yourself in. In the book, remember, Juliet Doyle is simply asking for her old neighbour and friend, Banks, to deal with it quietly, not to arrest her daughter and send her to prison. The reason it all goes wrong is that Banks isn’t there and it goes through official channels instead. Once you had the initial idea, what led you into the rest – including the re-introduction of Tracy? I thought I’d been neglecting Tracy a bit lately and favouring Brian. Then I thought that she might be thinking the same thing, too, that her father had abandoned her. I’d been considering the idea of having Tracy get into trouble for some time and this seemed the right occasion for it to happen. She was ready for rebellion and ready for adventure. In particular, she was ready to poke her father in the eye with a sharp stick. What better way of doing it? Yes – not much more of a better way! He come’s back fresh to be flung straight into the middle of chaos – Annie shot and his daughter missing! I hope you’ve never had a holiday ending in a similar way! Have you…? Thank God, no! Poor Banks. I realise I’ve done it to him again. He renews his relationship with Tracy as she is involved in the case, which is different from what he expects it to be as she has changed in ways he didn’t see. How did this part of the plot come about? Through not paying attention. Banks has focused more of his attention on Brian, the rock star son, and not realised how bad his daughter is feeling about her poor degree and her dead-end job. She’s mixing with a rather dodgy crowd, into taking E and coke, binge drinking, and she’s losing her bearings. I think Tracy and Banks still have a long way to go to make things right between them again. There are a couple of occasions in the book where Tracy almost reverts to being a little girl, wanting her daddy and sucking her thumb. One of my editors thought this was out of character and wanted me to cut it, but I saw it as absolutely essential to her character and insisted it stay in. Yes – I can see that. She was both a child and adult warring to fit as one, I felt. A complete contrast to the character of Jaff, who is rather chameleon-like as he veers between charisma and violence, not only just due to the drugs. What research did you do for him and where did he come from? I’ve known people like Jaff. Perhaps not quite as dangerous and messed up, but close. It’s partly the drugs, of course. They do skewer your perspective. It’s also partly the glamour, the aura of money and power and success. Don’t forget that his mother was a famous Bollywood star who died young. I wanted the really bad boy in him to emerge slowly throughout the story, so it would be believable through his charm, good looks and charisma that a girl like Tracy would run off with him in the first place. Only later, bit by bit, does he start showing his true colours. But by then it’s too late. I don’t want to give away the ending, but admit to being surprised by it, because I didn’t expect it. I suppose I thought Banks would take action and disarm Jaff; thereby saving the day and not that there would be that additional factor. It was definitely a good plot twist and for me came across as realistic. Was it in line with the research you did on the armed services? Well, it was hardly a sanctioned response, by the book, but I think it was in line with the character. It’s hard to say much without spoiling it, as you say, but I found that I liked the balance of tension and surprise. Suspense usually works best if you put all your cards on the table, but sometimes it’s a good idea to keep an ace up your sleeve. Will we see that individual again – I get the impression there’s some unfinished business there. Especially concerning Annie? I wouldn’t rule it out. There’s a lot of unfinished business, much of it concerning Annie. I tend to leave loose ends in many of my books and sometimes they come back to haunt me. That happened in Friend of the Devil and The Summer that Never Was. We should also not forget Phil from Playing With Fire. He’s out there somewhere, too. I also hope that Annie recovers sufficiently and is back beside Banks soon – do you have enough of the next story planned to know whether that will be part of it? Am I allowed any sneak teasers? Actually, I’m working on a standalone at the moment, a psychological suspense novel. Great timing, I know (smiles) since with the TV pilot and all, people will be craving more Banks - but these things happen. The idea’s been on my mind for a while and I couldn’t put it off any longer. I really look forward to that and new readers have got nineteen books to get through! Now, tell me, do you get much chance to read yourself and if so who? I read mostly when I travel, and at the moment I’m about halfway through Justin Cronin’s The Passage. I’m enjoying it. I’m also a subscriber to the Poetry Society and they have sent me Seamus Heaney’s new book as their autumn choice, so I’m looking forward to getting stuck into that. Hodder have kindly sent me Stephen King’s new collection of novellas, Full Dark, No Stars, and I’ve just downloaded William Faulkner’s Light in August on audio, so I have plenty to be going on with. What were the last two books you read and what did you think of them? Or last two CDs if more likely – would Banks have bought them too? Other than The Passage, the last two books I read were Karin Fossum’s Bad Intentions and John Wyndham’s first novel (as John Benyon), The Secret People, which I unearthed in a second-hand bookshop in Gisborne, New Zealand, a couple of weeks ago. The Karin Fossum was terrific, as usual, and the John Wyndham was as silly as you would expect a young man’s first sci-fi/fantasy novel to be. It’s no Day of the Triffids or Midwich Cuckoos, shall we say. It’s unlikely that Banks would have read either of them. He’s not a great fan of crime or sci-fi, though he was reading The Maltese Falcon the last time we saw him! Bearing in mind the Banks series about to premiere - have you had a chance to see much in the way of TV or film this year and if so what has especially grabbed you? I really enjoyed An Education. I first saw Carey Mulligan play Sally Sparrow in a scary Doctor Who episode called “Blink”, and she impressed me tremendously. She was great in An Education. The other film that stands out in The Secret in Their Eyes, an intelligent and absorbing Argentinean crime thriller by Juan José Campanella. I watch most of my TV on DVD as I never seem to be in one place long enough to watch a series, and I’m a fan of Mad Men, House and Spooks. in particular, I’ve also been re-watching some old costume dramas, such as The Duchess of Duke Street and The Pallisers. And now to be completely random and bring this to a close - who would you invite to a dinner party if you could have anyone, and who would Banks? Me: William Shakespeare, Bob Dylan, John Mortimer, Carey Mulligan, Francoise Hardy and Emily Bronte. Banks: Stephen Tompkinson, Julie Christie, Miles Davis, Graham Greene, Halle Berry and Bobby Charlton. The first episode of DCI Banks: Aftermath was shown on ITV at 9pm on Monday, 27th September. And as we go to press it was announced that Peter has been awarded the $10,000 Harboufront Festival Prize. He was chosen by a jury which included John van Driel, the VP of Programming and Operations for Classical 96.3 FM, Geoffrey Taylor, director of the International Festival of Authors, and some journalist named Mark Medley. “I am honoured to be awarded the 2010 Harbourfront Festival Prize. Having looked at the list of previous recipients, I believe it is a privilege to be in such august company and I find it incredibly encouraging that the committee has chosen to recognize crime fiction in this way,” Robinson said in a statement. Past winners of the annual prize, which was established in 1984, include Wayson Choy, Paul Quarrington, and Guy Vanderhaege. Helen Humphreys was awarded the prize last year. 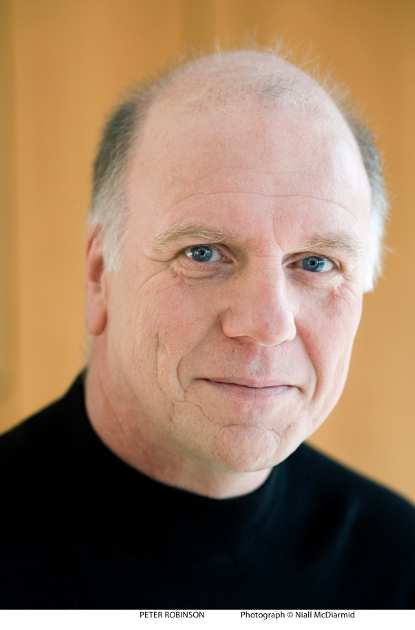 Robinson will receive the prize on the final night of IFOA, October 30.